This contemporary design shower head is made from high quality ABS which makes it a light, but durable model. Premium coating gives this showerhead a modern and luxurious look and feel. The hand held shower has 3 settings, Rain, Massage, and Rain and Massage mode. Rain mode functions as a full-body spray, and covers a wide area. Massage mode is a stronger, more focused spray, and works well for bathing pets. Rain & Massage mode puts out more water, but little softer. With the optional water restrictor that is included, flow rate can be restricted to 2.5 GPM. 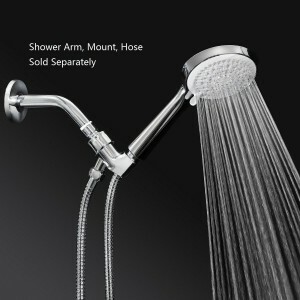 The shower head and the restrictor are easy to use and don’t require tools to install.